Enjoy cigars that were rolled in 1997 through 2011. 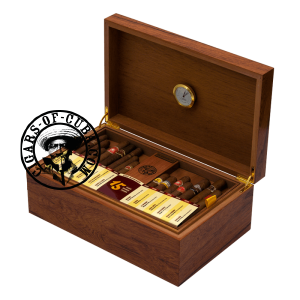 Produced in a very limited series of 15 unique numbered Swiss produced wooden humidors (capacity 50 cigars), each containing humidifier and hygrometer, this item will take pride of place in any cigar collection. You will find two examples of each cigar (30 cigars in total), for each of the 15 years we have been online. Each humidor is marked with an exclusive COC seal, which was specially produced for the COC 15th Anniversary Humidor by a famous local Cabinet maker, Cedric. The seal stamp is decorated with fine inlaid mahogany and elm and has its own storage box, engraved for the occasion. Each humidor carries this seal in Chinese ink, as well as the individual number of the humidor.